Apartment buildings are popping up like early-spring bulbs across the Coeur d’Alene-Post Falls landscape as builders feed strong demand for rental housing, particularly affordable units for students, seniors and low-income workers. “Seemingly, new apartments are coming out of the ground all over the place,” Coldwell Banker Commercial real estate broker Glenn Sather said Thursday at the Kootenai County Commercial Real Estate Forum in Coeur d’Alene. Nearly 500 building permits for new apartments were issued within the county last year and more than 500 are in the pipeline for this year, Sather said. That’s up from a historical average of about 200 units a year, he said. The trend reflects what happened during the Great Recession as well as the recovery, which lags the nation locally, he said. Multifamily housing development nearly ground to a halt when real estate markets went into a tailspin. “Not much was being built, capital was tight,” said Sather, a specialist in the apartment brokerage business. At the same time, demand for rental housing rose. Homeownership nationally has dropped from 69 percent a decade ago to 64 percent today. “That represents about 8 ½ million households that are now renting apartments that used to own homes,” he said. New projects are filling up as quickly as they are built. Kootenai County’s apartment vacancy rate was just 1.8 percent – almost a 20-year low – in the third quarter of 2014, according to a market survey. That compares with a vacancy rate of 3.5 percent in Spokane County. Hayden-based Viking Builders LLC, traditionally a builder of single-family homes, saw intense interest for its Fairway Meadows Apartments, a 70-unit, $7.4 million project completed last year on Ramsey Road one block north of Kathleen Avenue. “Every unit in that entire complex was leased before it was finished,” said Scott Krajack, the company’s land development director and estimating manager, in an interview earlier this week. 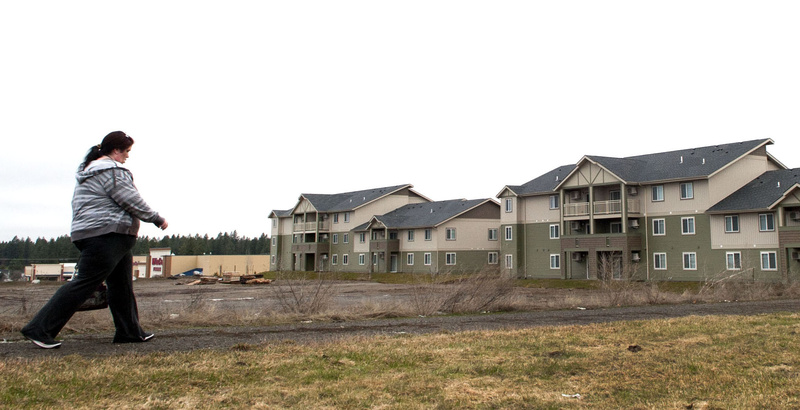 Viking also built the 66-unit Greensferry Apartments in Post Falls in 2008, and it’s getting ready to develop a 208-unit apartment complex in that city’s Fieldstone neighborhood at North Syringa Street and East Poleline Avenue. That project may roll out in two or three phases, Krajack said. With the housing market recovering, he sees pent-up demand for newer apartments. Many renters appear to be forgoing the traditional starter home, too, Krajack said. Sather said 50 percent to 60 percent of all apartment units built in Kootenai County in recent years are affordable housing projects, geared to people who earn between 30 percent and 80 percent of the area median income of $47,000 a year. These are not under the subsidized rent program known as Section 8 housing, but the lesser-known Section 42 program, which offers tax incentives to encourage development of affordable housing. The focus on affordable housing projects follows a 2011 study that concluded Coeur d’Alene had a serious shortage of affordable housing, both for low-wage and high-earning renters. Developers using tax credits to boost the inventory of low-income housing include Hayden-based Whitewater Creek, which is building hundreds of affordable apartments in the Riverstone mixed-use community near the Spokane River and near the CrossRoads Coeur d’Alene retail development anchored by WinCo Foods. Sather said many are asking about the apartment boom and wonder what the growth in low-income housing will mean for market rates. “I have come to the conclusion that what’s happening out there is really a good thing,” he said. Thirty percent of county residents are renters, but in Coeur d’Alene the number is 43 percent, Sather said.